We asked the prospective candidates for each party in the Local Elections to answer a number of questions relating to the regeneration at Elephant and how it will affect local people. We received responses from the Liberal Democrats, the Green Party, and Ken Hayes (Independent) and these can be seen below. The Conservatives and The Labour Party did not respond to our questions. Question 1: A steering group for the Elephant Regeneration has been set-up without any tenant and resident or councillor representation. Do you agree with this? 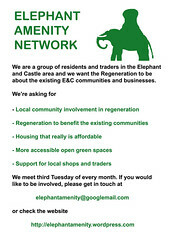 Would you support establishing an Elephant Community Trust, like the New Aylesbury Trust, but with elected tenant and resident representation? LIB DEM: No steering group has been set up but if elected we would like to see one set up which engages with all members of the community, including voluntary sector and faith groups, tenants and residents groups, as well as other community organisations. GREEN: YES we would support such a Trust, and would support establishing it as a Community Land Trust with ownership and control of any parcels of land that the council can renegotiate. Question 2: Everything to be built at the Elephant will have to get planning permission. Would you support all planning applications going to the local Community Councils, as part of the pre-planning process, so that local people can give their opinion on them? LIB DEM: We think it’s really important that local people are involved in the consultation on all the planning applications at the Elephant, as well as the overall masterplan. We think the Council needs to use as many methods as possible to engage local people in the regeneration of the area, and community councils are one possible way of doing this. Ian Pocock/Timothy Martin – Green: YES, and we would support more council resources being devoted to increasing local resident and business involvement, potentially by establishing a sub-group of the Community Council to discuss particularly controversial aspects in more detail. Question 3: The London Plan requires that 50% of all new housing developments are affordable. Southwark’s Core Strategy proposes only 35%. Would you support an increase to 50%? LIB DEM: We will do everything we can to argue for the maximum possible number of affordable homes, particularly social rented homes, in each development as 35% is the minimum not the maximum level required. GREEN: YES with the proviso that we believe Southwark Council is failing in its duty to plan for more social housing in other parts of the borough. If the overall level of social housing was increased in places like East/North/central Dulwich and Bankside, we would support a greater proportion of intermediate housing in Elephant & Castle if it was delivered through a Community Land Trust to lock in long-term affordability. Question 4: The London Plan requires that 70% of affordable housing is social rented. Many of the developments at the Elephant will have no social rented housing (Oakmayne Plaza, Strata Tower, Eileen House). Will you object to any planning applications which don’t have social rented housing? LIB DEM: Liberal Democrat councillors have in the past objected to applications which fail to provide the amounts of social housing set down in planning policy. If elected, we would continue to campaign for the highest amount of social rented housing possible on each development, but this would need to be balanced with the demand for other forms of affordable housing such as shared equity, which has helped some Heygate leaseholders for example to find new homes. Question 5: Southwark has proposed selling Maydew House in Bermondsey to fund attaining Decent Homes Standards could be replicated across the Borough. Would you support or oppose such proposals? LIB DEM: No decision has been made on the future of Maydew House. As local candidates, we believe that Council housing – both the ability to build new homes as well as to bring existing homes up to a ‘decent’ standard – is a massive priority for Southwark. That is why as local Liberal Democrats we are backing Simon Hughes’ campaign for more government investment in Council housing so that the Council can spend more on our local homes. GREEN: OPPOSE. Southwark suffers from a chronic shortage of social housing, so selling off large blocks to fund improvements to the shrinking stock isn’t the answer. The Green Party is campaigning for all historic debts to be dropped, to allow councils to funnel the rent revenue into Decent Homes and to invest billions in a new council house building programme. Question 6: There may be some considerable time between demolition of the Heygate Estate and occupation of the buildings that will be built on its footprint. The estate represents a key pedestrian route for local people, especially those living to the south. – do you support maintaining key pedestrian routes? – do you support temporary alternative uses, such as allotments, whilst the masterplanning is being drawn up? LIB DEM: YES – we are committed to ensuring that walking routes are kept open and that where necessary they are made safer through better lighting and more frequent patrols by community wardens and the Police. YES – but it is important that local residents are consulted about any alternative uses. GREEN: YES where they are safe in terms of architectural design, being overlooked, well lit, etc. YES, and Councillor Jenny Jones has consistently called for this. We would also want the council to re-evaluate schemes that are stalled and explore the possibility of short-term use by a self-help co-operative of certain parts of the Heygate Estate and other empty homes in the vicinity. – the new buildings should allow retention of the vast majority of these, say at least three quarters, within the new development? – that no trees should be removed prior to consultation and receipt of public feedback on any planning proposals requiring removal of trees? LIB DEM: Clearly as part of any masterplan the existing trees need to be taken into account and there is a strong argument for keeping as many of them as possible. In our view those trees that remain will need to be taken into account in future planning applications which will need to be consulted on as widely as possible. Question 8: The regeneration project is now scheduled to take 15+ years. How do you think that the vitality of the existing amenities used by the local community (shops, markets, community facilities) can be maintained and enhanced over this length of time? LIB DEM: One of the great things about the area is the number of independent small shops which is why we campaigned to save the Rodney Road shops and post office services in Maddock Way. We want to ensure that in the masterplan there are places for existing businesses to relocate to if necessary to ensure that they prosper. If businesses have to move, or access routes have to be altered, it is clearly important that signage is put up to tell people where the shops have moved to. It is also important that the shopping centre continues to be advertised widely to tell people that business is continuing as usual during the redevelopment. 3.Try to break the very large regeneration sites into smaller sites, and parcel them out to a more diverse range of developers to de-risk the regeneration and allow a staggered approach to get moving quickly on areas around the “centre” and adjacent to amenities. Ken Hayes – Independent: Southwark Council and the developers should offer alternative space in the Elephant area for the shops and market Stall holders while the development is taking place as Small and medium sized businesses will cease trading and go out of business. Market traders will move to another area never to return. This alternative provision should be provided before the demolition of the Elephant and Castle Shopping Centre begins. The National companies, e.g., Tesco do not need such provision as they have other local outlets. The residents of the Heygate were promised adequate new build affordable housing to move to but only a fraction of what was promised was built. The same must not happen with the local businesses and services. I am a life member of Southwark Chamber Of Commerce and the Chamber will support this measure.